In a realm all its own called Orsa, there are numerous worlds and each one of them is a tale to be told. In particular this specific planet is named Yureaty, a mystical place where magic and various spiritual forces have formed a lifestyle for the planets inhabitants. The people of Yureaty have both grown accustomed to magic and the expansive awe that such a force can bestow upon the world to cause a natural order of life, death and certainly that which lies in between. For many thousands of years worth of time the cycle of magic, life and death has remained manageable for the Yureatyns as a single object has has always kept the balance between aether and nether equal. This object has been called the Ultra Rose since anybody can remember, forwarding the fact that it has nearly always existed in the minds of just about everybody on the planet. So long as the Ultra Rose remains intact life can continue and peace can be maintained. It may be true that on any world the possibility of a perfect world seems impossible but for the Yureayns conflict has remained at a minimum. Everybody in the mystical land of Yureaty knows that regardless of what happens, the magics and spiritual forces that drive the world will not fail them, not as long as the Ultra Rose stands. As far as anyone is concerned, this is something that will be safe for something close to an eternity, as there are few who know where this object is and even fewer who might slip up and have cause to reveal the location. As Yureaty is a world where there is an abundance of magic and other mystical phenomena taking place, the idea of dragons existing shouldn't be too difficult for the minds of the Yureatyns to comprehend. Prophecies of the planet falling into peril have always been spoken of among the three races. The times when dragons are to awaken and choose their partners has come. The dragons of legend have awakened to bestow upon individuals the power to change the world. Beings that are destined to have a dragon partner are called those of the Dragon-Soule. With this being a new reality in the past 110 years to present day of Yureaty, many dragons have awakened from their slumber, seeking out a partner to share its essence with. In fact the very essence and soul of each dragon is intertwined with the Dragon-Soule that causes a shared sentience between the two beings. A Dragon-Soule might very well have a darkened heart and only care to bring himself or herself to power, doing what they please to advance in life. If this is so their partner dragon more than likely is evil just like the soul it connected with. The dragons and their partners are strongest when near each other as their souls influence one another. Magic flowing around the soul of the dragon is imbued within the Dragon-Soule to produce Those chosen are beings with vast magical capabilities from having access to the a dual soul. When separated from their dragon, a Dragon-Soule must rely more heavily on their weapon. Unbeknownst to the inhabitants upon Yureaty, internal conflict has arisen between the Council members causing an uncertainty about the future of the planet. Monsters have become more violent, untamed and hordes of them have been appearing at obscure locations around the world. Some rumor that is part of the Legend of Recreation, a period where magic will act to bring evil to its knees and restore the world after cleansing evil. Others have rumored that the legend states that when the beasts of old arise, the Ultra Rose will be no more. With so much broken information there has even been talk of the Ultra Rose Council being involved, though in reality it is the act of a single man. He was once one of the council but an underlying prophecy about creation caused him to leave and head down a path of legendary death and destruction. He has been behind the recent attacks on cities, and places known to house both ancient deities, and spiritual forces that could render entire regions desolate in hours. If the Ultra Rose is being affected, great disaster might be coming to Yureaty, bringing it to a time that calls for drastic change, no matter how absurd to the people it may be. Yureaty now hangs in the balance of the Legend of Creation Crisis and the rise of the Dragon-Soule. Will the world be restored to prior content and peace, fall into tragedy, or end up in a new age altogether?? This is what will be decided. This race is abundant on most worlds that exist within Orsa. They are closest to human beings in anatomy and often are skilled in the manipulation of every type of magic as their souls have properties blessed specifically by the Ultra Rose. An Orsanite could have nearly any type of skin, hair, body build etc and often, magic further influences the way an Orsanite looks. As for aspirations, like any race the thoughts and desires of an individual can also vary but Orsanites have a huge drive to accomplish what others say they cannot. Such beings aren't the strongest, or fastest of the three races but their ability to regenerate from even near fatal wounds with rest is phenomenal among the three races. A race where folly can mean death...Shar'ren are more violent than the other races yet mentally sharper, being fueled by raw emotion. These beings are relatively short and have a different anatomy than the Orsanites. The tallest Shar'ren in history was only recorded to be 5'2. Their bone structures and muscles are more durable and malleable, making them on average stronger than Orsanites and a lot more flexible. They can pick up speed during movement quite fast but being shorter and denser also causes the Shar'ren to tire out from physical exertion quicker than both the Orsanites and Majdraan. Magic comes naturally to the Shar'ren but is used by them to most often to imbue objects and weapons with mystical force. Dragon-Soules have a dragon partners vary in size and shape. Some choose to stay in a baby dragon form and others like to be larger or in the middle. Dragons also have the ability to transform into several forms but this takes larger amounts of magical force to accomplish. Each dragon will have a choice of these elements; Earth, Wind, Water/Ice, Fire, Light, Darkness, Gravity, Lightning, Psionic, and Metal. I seriously want you all to use the given elements and not all pick the same element, so for now I will only allow two of the same element until further notice. The chosen element will also be the force that your character will control through magical, or spiritual properties that for the most part are focused through not only the dragon’s body but some kind of weapon as a conduit. Ultra Rose Council Members wield the pure force of one of the listed elements but they do not to need a weapon to focus it. Rather than a dragon partner, they possess the ability to transform into a mythical creature which could have varying stages. Some of them have a bond with another mythical animal, much like the Dragon-Soule do. For now that really is all that you need to know, but seeing as this is the OOC thread, ask questions if and when you need to. I'll be lenient with ages because of magic being involved. Do you have a serpent or an oyster?? Who are you and why?? Pics are fine but I still want two paragraphs minimum for detail. You are allowed two. Each weapon requires a detailed explanation of how your particular element is used. You may have two skills that aren't magical in nature. Refer to character information. Also like with weapons explain your dragon's use of your selected element. This should reflect the personality of the Council Member. Forces of the Ultra Rose enable these guys to be really old. Let's be mature eh?? You're a Council Member for a reason. You are allowed an element. Please describe how your Council Member is able to use magic to control and/or use this force. You may have four skills that aren't magical in nature. No bio, if you get a spot I'll inform you via PM about this. Be CREATIVE. Let loose and expand your knowledge into your role playing experience. Put “Super Dragons” at the top of your template. Looks nice. I'm definitely joining as you already know. I'll work on a Dragon-Soule temp. I'm think fire will be my element since I have an idea to use Gios for this. Sounds cool, but I have a few questions that I'll ask later. Guess I'm in. Posting something later. I have a question about the Dragon-Soule Weapon. Like, I'm not clear on what exactly that entails. I've read the OP a few times, but I still don't quite understand what it is exactly. Absol is a meta-being able to use his thoughts alone to accomplish numerous feats involving psionic manipulation. Over a period of many years this kind of magical manipulation is what gave the former Ultra Rose Council leader the name Absol in for short. His mind is an expanse in itself which produces magical force that is used to produce psionic energy, a force which he can graft completely to his own form. An immense adaptation to this force allows Absol to produce varying effects via his magical might in general. The overall nature of Absol's mind is phenomenal in the sense that he has an inner mechanism completely different from the rest of the people on the planet of Yureaty. His mind itself seems to be akin to something similar to a white hole. Absol has manifested his psionics primarily into a medium of both fine tuned manipulation and destruction. In addition to using his mental prowess to produce a slew of differing non elemental forces or effects; having a synch with Imperious also fuses a spiritual aspect to the abilities that Absol can manifest. The workings of Absol's body are able to be freely manipulated by him to produce assorted effects on himself. He can both grow appendages and alter the size and shape of his body, also having the ability to manipulate the density of his biological matter. This type of manipulation has given the psion monstrous physical conditioning which includes strength, durability and malleability. He also regenerates damage at a rate 30 times that of most life forms. By also influencing both his body and soul, Absol channels psionic magic throughout his entire body on both a spiritual and physical basis. He is more than able to subconsciously adapt his body to conform to many situations and act accordingly without needing to specifically conjure a mass amount of magical force. Absol is able to both generate and manipulate psionic energy to produce force fields for many purposes. Unlike a normal barrier made from elemental magic, his fields are generated from raw psionic force that has been affected by spiritual means he can use to cause overlying effects of the incarnum nature. Absol can make them in nearly any size or shape so long as he has enough focus to maintain them. Offensively Absol can fire miniature force field bubbles, bullets or bombs from his hands or fingertips, along with rapidly producing a flat force field to ram into objects and so on. Absol has spent many years using this ability, so his soul field control is extensive, he can affect similar types of force fields by disrupting them with his own or by erecting a field within another to dismantle fields produced by elemental magics. Absol has the ability to manipulate matter in such a way that he is able to directly convert physical matter into thought patterns or waves and then absorb them into his mind. This allows Absolon to take items and store them inside a dimension within his brain that he has access to at all times. He is able to drain or manifest the tendencies and abilities of objects that are absorbed, and release them from his mind in the same state he absorbed them in. After already being absorbed these objects can be manipulated via his knowledge and then released in forms similar to their original state. Even with this ability, absorbing larger objects causes a greater amount of strain on Absol and take longer to accomplish. Absol can imprint the soul of objects within his being after absorbing them and gather information about absorbed objects as well. Within Absol's mind is a micro white hole that spews forth soul matter and energy among other materials, which the Ascended One uses to manifest telekinetic force of the purest kind. He is unable to perform most complex feats such as advanced matter manipulation such as transmutation of matter or subatomic manipulation but that is replaced by raw force. Absol's telekinetic prowess can prove devastating, the potency he creates can cause matter to shatter, disintegrate and explode from coming into contact with white soul matter. He can both push and pull at physical, spiritual and magical material using his telekinesis. In fact Abcan create concentrated forms of psychic energy to disperse over a wide area to do immense amounts of collateral damage. The power scale of this ability is colossal given years of practice and the mixture of incarnum force within the energy/magical output generated by Absol. The remote manipulation of Absol's mind even allows him to progressively manipulate matter over vast distances. He is also skilled in manipulating a multitude of objects simultaneously with great focus. For instance Ta'avy could open 20 safes at the same time. Ta'avy has the ability to manipulate the force of his soul's immense force to affect the outside world and in turn bond and influence objects that are inorganic to have a sentient nature. His soul has expanded and molded to both his weapon and Dragon-Soule weapon, giving each a stronger link to the magics generated by he and his dragons inner spirit. This projects and amplifies his monstrous spiritual energy to be reflected in all physical actions, giving her astounding physical stamina, reaction and control over her own his own soul to expend his life force in a way where his spirit can be seen physically during movements as a hazy apparition or pink shadow. Due to his spirit literally taking shape in both his weapons and as an extension of his resolve, he is able to use his soul to manipulate nature in a general degree around his person to naturally perceive what can be seen and not seen. As former leader of the Ultra Rose Council is greatly attuned to the forces of magic, even without his body being influenced by Imperious or any such forces. Since he was a child the availability of magic to him was always present, so being a Nephalem only amplified his natural magical affinities. His understanding of magic is extensive, being able to cast and defend against higher tier spells with relative ease or lack of any effort, Ta'avy has the innate power to adjust his own magic accordingly and even use to cause unorthodox uses of it on himself. Ta'avy's thoughts alone have acted as a gateway into his own mind making it entirely able to be customized, unable to be damaged by outside forces. His own mental structure can be altered at will manifest emotions, sensations, perceptions, consciousness, memories and personality. In the same sense he has access to all of these features of his own mind while giving efficiency and psychological conform in all situations, while preserving the ability to feel sensations and emotions. This ability also grants the him complete immunity to mind-related abilities and magics. The sensuality of power in Ta'avy's left hand. It is the manifested pink hue that radiates the purest possible act of what is into and out of Ta'avy. This hand can form both a physical and spectral blade, the mere size of the weapon alone can make it a difficult weapon to defend against. Ta'avy's use of the blade is phenomenal, he can switch back and forth between the blade formats easily and also focus psionic energy throughout the blade. The crystal core holds immense energy within it, enough in fact to cause magic to rush from the blade as detachable crystals that can chase and swarm foes with various psychic adaptations. The force is so pure that the spells developed and cast can be incredibly devastating. Imperious' magical forces are embodied within Ta'avy's right hand as a pulsing red glow that can be dull or fierce when in use. The aspect of aether is present in this "weapon". A miniature portal forms directly from Ta'avy's palm, releasing aether to produce an array of destructive magics that can disembody materials by literally tearing the "soul" out of them. Normally blasts of aether that house disturbing effects are released from Ta'avy's hand. He can manipulate the size, shape and effects of the blasts, simultaneously manipulating soul matter to animate objects hit with the disembodied aether released from his hand. Soul Edge Infinity is even more potent a weapon than Soul Calibur Infinity as it is a fusion of both psionic force and spiritual dominion that exceeds one separate force or another. Imperious is a chipper dragon, unlike some other dragons that seem angry, or act much alike their partners. This dragon is much too happy for some people, yet as things would be, Ta'avy has no problem with this at all. Imperious is an individual dragon that is quaint and openly chipper with no fear of persecution or harm. His faith is higher than most other dragons as he holds fast the idea that his partner can overcome anything he needs to at any time. 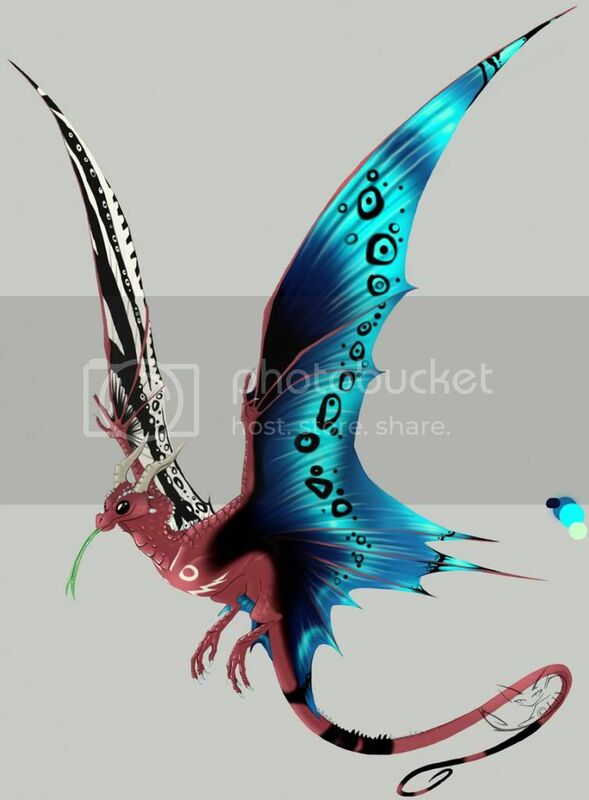 Flamboyancy is also another obvious nature that the dragon has, he is kind of mischievous but not extremely so. Like Ta'avy, he is very intelligent, his knowledge of dragon and magic types and the three species has given him an immense understanding of the processes that fuel Yureaty. A beautiful entity that has a serene look about it that makes those who witness him stare in partial awe, not to mention the trance that seems to flow from Imperius' natural disposition. This dragon sits atop Absol's shoulder, but at times it can be seen gracing alongside him with its chimera-like serpentine makeup gleaming. Imperious goes from extremes of beauty, to a revelation of majestic valor that it rocks the mind. As compact as this dragon wants to be, it doesn’t grow much larger than around 8 feet tall, being about 11 feet long tailed included. The dragon now houses more force than ever, and obviously is a deadly force to be reckoned with, its power now lingering on levels of spiritual dominance that are hard to fathom. Imperious is smaller than other dragons based on the fact that big power comes in teeny packages. If you see Imperious in this form...start running. Maybe it'll save you, probably not though.